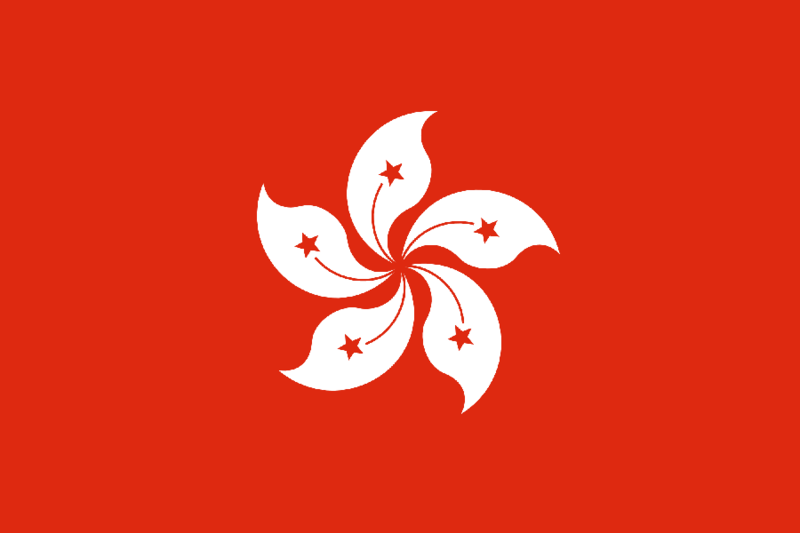 The flag of Hong Kong features a white, stylised, five-petal Hong Kong orchid tree (Bauhinia blakeana) flower in the centre of a red field. Its design was adopted on 4 April 1990 at the Third Session of the Seventh National People’s Congress. The precise use of the flag is regulated by laws passed by the 58th executive meeting of the State Council held in Beijing. The design of the flag is enshrined in Hong Kong’s Basic Law, the territory’s constitutional document, and regulations regarding the use, prohibition of use, desecration, and manufacture of the flag are stated in the Regional Flag and Regional Emblem Ordinance. The flag of Hong Kong was first officially hoisted on 1 July 1997, in the handover ceremony marking the transfer of sovereignty. The Chinese name of Bauhinia × blakeana has also been frequently shortened as 紫荊/紫荆 (洋 yáng means “foreign” in Chinese, and this would be deemed inappropriate by the PRC government), although 紫荊/紫荆 refers to another genus called Cercis. A statue of the plant has been erected in Golden Bauhinia Square in Hong Kong. Although the flowers are bright pinkish purple in colour, they are depicted in white on the Flag of Hong Kong. The design of the flag comes with cultural, political, and regional meanings. The colour itself is significant; red is a festive colour for the Chinese people, used to convey a sense of celebration and nationalism. Moreover, the red colour is identical to that used in the national PRC flag, chosen to signify the link re-established between post-colonial Hong Kong and China. The position of red and white on the flag symbolises the “one country two systems” political principle applied to the region. The stylised rendering of the Bauhinia blakeana flower, a flower discovered in Hong Kong, is meant to serve as a harmonising symbol for this dichotomy. The five stars of the Chinese national flag, representing the Communist Party and Mao Zedong’s four classes (proletarian workers, agricultural peasants, petty bourgeoisie and capitalists), are replicated on the petals of the flower. Prior to Hong Kong’s transfer of sovereignty, the flag of Hong Kong was a colonial Blue Ensign flag. The flag of colonial Hong Kong underwent several changes in the last one and a half centuries. Before Hong Kong’s transfer of sovereignty, between 20 May 1987 and 31 March 1988, a contest was held amongst Hong Kong residents to help choose a flag for post-colonial Hong Kong, with 7,147 design submissions, in which 4,489 submissions were about flag designs. Architect Tao Ho was chosen as one of the panel judges to pick Hong Kong’s new flag. He recalled that some of the designs had been rather funny and with political twists: “One had a hammer and sickle on one side and a dollar sign on the other.” Some designs were rejected because they contained copyrighted materials, for example, the emblem of Urban Council, Hong Kong Arts Festival and Hong Kong Tourism Board. Six designs were chosen as finalists by the judges, but were all later rejected by the PRC. Ho and two others were then asked by the PRC to submit new proposals. Looking for inspiration, Ho wandered into a garden and picked up a Bauhinia blakeana flower. He observed the symmetry of the five petals, and how their winding pattern conveyed to him a dynamic feeling. This led him to incorporate the flower into the flag to represent Hong Kong. The design was adopted on 4 April 1990 at the Third Session of the Seventh National People’s Congress, and the flag was first officially hoisted seconds after midnight on 1 July 1997 in the handover ceremony marking the transfer of sovereignty. It was hoisted together with the national PRC flag, while the Chinese national anthem, “March of the Volunteers” was played. The Union Flag and the colonial Hong Kong flag were lowered seconds before midnight.